Mozart (1756-91) is perhaps the most well-known composer of all time. He and his Austrian compatriot Josef Haydn (1732-1809) are the two most important figures of the musical period known as the CLASSICAL PERIOD (c. 1750 – c. 1810). To understand their music well it is important to look at the many developments of society and of philosophy which were current in Europe at that time – the time of the foundation of modern Europe and of modern history, or the “Age of Enlightenment”. The two most significant political events of this time were the French Revolution in 1789 and the replacement of government by monarchy by the first republic in Europe in France in 1792. The theme of “power to the people” (rather than to the monarchy or aristocracy) came about in two phases: phase one was from 1763 – 1780, when, after a long war, the monarchies of Europe were keen to increase the quality of life and culture for the “common people”, improve their economies and bring political stability; phase two was from 1780 onward, when the monarchies who still wanted to keep their wealth and power structures were increasingly attacked for their failure to sustain the move towards greater democracy. The demand of the European settlers in the USA to govern independently from the British King (American Declaration of Independence – 1776) sent an impulse to the European middle class to overthrow their monarchies which could not be resisted. From 1740 – 1763 most of Europe was at war in the War of Austrian Succession and there was little time or money for artistic endeavour to be supported. After the ‘Austro-Prussian Peace’ of 1763 cultural life flourished, whether in the areas of architecture, theatre, music, art, scientific research, literature or philosophy. On the one hand, cultural activity was seen as a way of glorifying the ruler and the state. On the other hand, an emphasis on idealising the natural and contemporary, brought into question age-old traditions and concepts such as ‘divine-right’. This led to a huge step away from the old Baroque ideals of art. It contained the seeds of criticism of and liberty from the age-old structures of monarchic government and society. Four aspects of late eighteenth-century life are especially important for understanding the background of the music of the Classical period. 1. More than ever, the courts of Europe had become COSMOPOLITAN. Kings and queens were frequently not from the same nation as the people they ruled over (e.g. in Britain George I (1714-27), George II (1727-60) and George III (1760-1820) came from the aristocracy of Hanover in northern Germany. Sweden, Poland, Russia, Naples and Tuscany also had non-native rulers). Courts and diplomacy everywhere were dominated by the French language. Transport was becoming more efficient. Cultural interaction was increasingly possible. For example, Mozart was welcomed in Paris, London, Milan and Rome as well as all major cities of Germany and Austria. The critic Chabanon declared in 1785 that “Today there is but one music in all of Europe …. this universal language of our continent”. 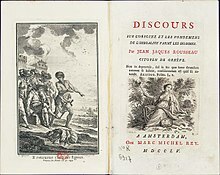 Frontispiece and title page of an edition of Rousseau’s ‘Discourse on Inequality’ (1754), published in 1755 in Holland. 2. The Enlightenment was also HUMANITARIAN. Programmes of social reform led to public hospitals and sanitation systems, universal schooling and (first introduced in Austria in 1781) the abolition of serfdom. Such reforms were complemented by the writings of J-J Rousseau (“Emile” and “Social Contract” – 1762), the most important philosopher of the time. These initiatives led to a great growth in the middle classes and a blurring of the old “master and servant” mentality. The concept of equality and universal brotherbood was a theme of freemasonry. Freemasonry spread through all ranks of society including in their numbers kings (Frederick the Great of Prussia), poets (Goethe) and composers (Mozart). 3. With the rise of an independent-minded middle class came a POPULARIZATION of the arts. Public theatres, galleries and concert-houses became as important a source of income for artists as the palaces of the aristocracy. This led to the arts presenting us with natural and appealing themes, with an easily identifiable emotional content. The monumental music of the Baroque, which expressed only one emotion in each movement, gave way to a style where, in any one movement, a natural and contemporary expression of several contrasting emotions might arise. The German term Empfindsamer Stil (“Sensitive style”) is often used to describe this music. 4. Finally, the Enlightenment was a RATIONAL age. Advances in the empirical sciences were being harnessed to economic advantage as never before. With Arkwright’s first spinning mill in 1769 the industrial revolution was only a matter of time. Rationality showed itself, too, in literature, especially in the newly popular form of the novel. Here success depended on clarity, animation, good taste, proportion and elegance. All of these aspects are hallmarks of the instrumental musical forms which developed at the time: the sonata, the symphony and the string quartet in particular. Style galant – a style particularly associated with the fortepiano composers of the period 1730-1770. It is an emotionally light style with excessively florid melodic writing to simple harmonies, usually in major keys. Empfindsamer Stil – like the “style galant”, but with a tendency to use a wider range of keys (including minor keys) and more emotional intensity brought about through sighing motifs and chromaticism. It flourished in the 1750s and 1760s with C.P.E.Bach as its most significant composer. Sturm und Drang – A style emphasising the dramatic conflicts possible in the classical style. The music is often in minor keys. The name comes from a literary movement, led by Goethe. The style flourished in the 1770s, especially in the hands of Haydn and Mozart. Mozart’s early G minor Symphony K183 illustrates the style very well.